Are you clued in to the new Star Trek series? It’s called Star Trek: Discovery and airs on CBS All Access. I know what you’re thinking. How can I watch this, Jane? I don’t have access to CBS All Access. Read on, my friends. How and when can you watch Star Trek: Discovery? Star Trek: Discovery will air its first episode of the series on Sunday, Sept. 24 at 8:30/7:30c (time approximate following NFL Football and 60 Minutes) with a special broadcast premiere on the CBS Television Network. The episode will also be available to stream live and on-demand on CBS All Access. Then, the second episode of Star Trek: Discovery will be made available on CBS All Access THAT SAME NIGHT following the broadcast premiere. After premiere night, all-new episodes will be made available on-demand weekly on Sundays after 8:30 ET/5:30 PT, exclusively for CBS All Access subscribers in the United States. So, you get to check out the first episode and see if you like it. Based on the trailer below, I think it’s safe to say that most Star Trek fans will also be fans of Star Trek: Discovery. It features all the Star Trek elements we’ve grown to love over the show’s many incarnations. I’m sure there will be quite a few podcasts devoted to Star Trek: Discovery, but my friend Mike Moody has the best. He and I go back to the days when we both wrote for TV Squad, and now he has a thriving podcast business called Permanent RCRD (click through that link and check out all the shows they cover!). If you’re in need of podcast services – editing, producing, managing, etc. – please email him at studio@permanentRCRD.com. Their studio is in Austin, but they also work remotely. And definitely subscribe to Permanent RCRD’s Star Trek: Discovery podcast on iTunes right here. If you’re so inclined, I know Mike and his crew would love it if you’d leave a review, as well. 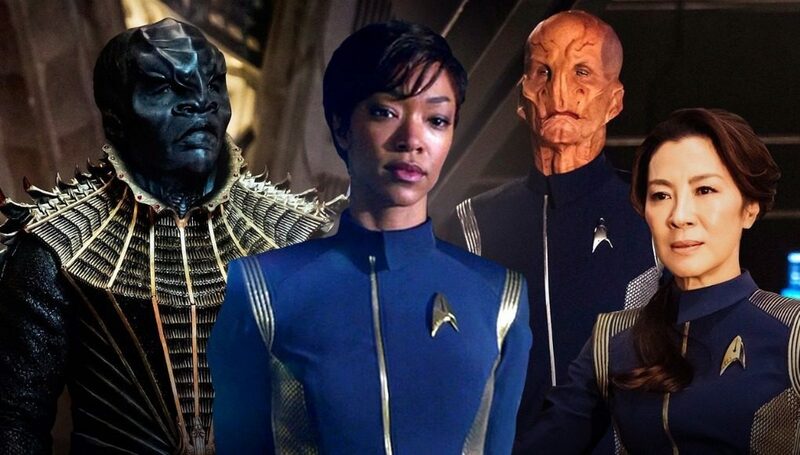 What’s Star Trek: Discovery about and who’s in it? The new series will feature a new ship, new characters and new missions, while embracing the same ideology and hope for the future that inspired a generation of dreamers and doers. Expect lots of action, along with some comedy, drama, and a mix of fascinating characters we’ll grow to love and hate. The cast of Star Trek: Discovery features a wealth of familiar acting talent and exciting new faces, including: Sonequa Martin-Green (First Officer Michael Burnham), Doug Jones (Lieutenant Saru), Jason Isaacs (Captain Gabriel Lorca), Shazad Latif (Lieutenant Ash Tyler), Anthony Rapp (Lieutenant Paul Stamets), Michelle Yeoh (Captain Philippa Georgiou), Mary Wiseman (Cadet Sylvia Tilly), Chris Obi (T’Kuvma), Mary Chieffo (L’Rell), James Frain (Ambassador Sarek), Rainn Wilson (Harry Mudd), Terry Serpico (Admiral Anderson), Maulik Pancholy (Dr. Nambue), Damon Runyan (Ujilli), Rekha Sharma (Commander Landry), Kenneth Mitchell (Kol), Clare McConnell (Dennas), Sam Vartholomeos (Ensign Connor), and Wilson Cruz (Dr. Hugh Culber). The series is produced by CBS Television Studios in association with Alex Kurtzman’s Secret Hideout, Bryan Fuller’s Living Dead Guy Productions, and Roddenberry Entertainment. Alex Kurtzman, Bryan Fuller, Heather Kadin, Gretchen J. Berg and Aaron Harberts, Akiva Goldsman, Rod Roddenberry, and Trevor Roth serve as Executive Producers.